Becky Albertalli’s Simon vs. the Homo Sapiens Agenda is one of my favorite reads from the past few years. Simon and his fabulous group of friends just made me smile the entire time I read that book so when it was announced that Albertalli was doing a follow up book called Leah on the Offbeat about Simon’s best friend, Leah, I couldn’t pass up the chance to read it. 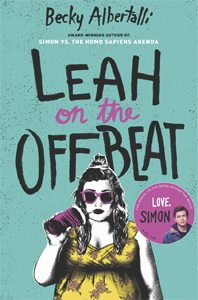 I don’t even know where to start aside from to say that I absolutely adored everything about Leah on the Offbeat, especially the main character herself. How do I love Leah Burke? Let me count the ways! I love her snark, her sarcasm, her badass drummer girl persona, that she’ll let an F bomb drop without batting an eye, and most of all, I love that she is so much more than all of the things I just listed. She is a teenage ball of angst just like most of the rest of us were when we were in high school. It was just so wonderful to visit Creekside High again and see Simon and the gang as they are going through their senior year and getting ready for college. I know it’s been ages since I was a senior but Albertalli so vividly portrayed all of the quintessential senior activities – like senior prom and applying to colleges and stressing while you waited to here if you got into your first choice, and of course constantly thinking about how this is the last time you’re going to hang out with your best friends before everything changes, etc. – that I felt like I was right back in high school myself. Her dialogue is fantastically spot-on, and I especially loved how many Harry Potter references she had sprinkled throughout the book. Albertalli also does a fantastic job of realistically portraying all of the relationship turmoil that inevitably happens in high school and the impact it can have on even the most solid of friend groups. I think many people will find Leah’s predicament relatable as she feels stuck in the middle watching couples in her friend group break up and not knowing what to do about it. The angst that she experiences as she realizes she is attracted to one of them is also very relatable, not to mention the added stress that she is bisexual but has yet to come out to any of her friends, even though at least two of them are openly gay themselves. Leah’s life is just a big ball of awkwardness beneath that cool drummer girl persona. 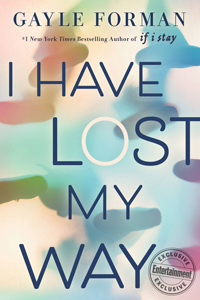 Set in New York City, Gayle Forman’s I Have Lost My Way is a poignant story that follows three young people – Freya, Harun, and Nathaniel – each of whom has lost their way in life and needs help getting back on track. Freya is an almost famous singer but has mysteriously and unexpectedly lost her singing voice right in the middle of recording her debut album and doesn’t know what will become of her or her career if it doesn’t come back. Harun is a gay Muslim who is desperately trying to figure out how to come out to his parents. He is sure his family will react badly, but he also knows if he doesn’t come out soon, he is in danger of losing James, the love of his life. Nathaniel is a young man who has come to New York with nothing but a backpack. All we know when we meet him is that he seems confused and disoriented upon his arrival to the city, keeps calling a phone number and listening to a message from his father, and that he also appears to be starving. Nathaniel definitely appears to be lost, both physically and in other ways, but it doesn’t become clear until much later in the story just how lost he really is. An accident of fate brings these three lost souls together and as they slowly bond with one another, they realize that perhaps helping each other is a way for them to find themselves again. I Have Lost My Way is a relatively short book but it packs a huge emotional punch, particularly if, like me, you’re a fan of character-driven stories. Forman presents her story from the perspectives of Freya, Harun, and Nathaniel so that we are able to dive deep into their minds and see firsthand just how lost and alone all three of them are feeling. I also loved the way the book was structured in the sense that even though the story itself only spans the course of a single day, through the use of flashbacks throughout the novel, Forman is able to really flesh out each of these characters and give Freya, Harun, and Nathaniel each a rich history as we explore their complicated relationships with various family members and other loved ones and how exactly they found themselves in the emotional states that they’re in when we meet them. Those flashbacks allowed me to quickly become very invested in the well beings of all three characters even though I only really met them for one day. 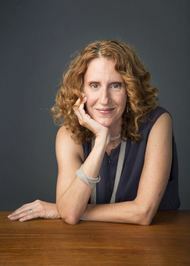 Gayle published Leave Me, her first novel starring adults in 2016 and her latest novel, I Have Lost My Way, came out in March of 2018. 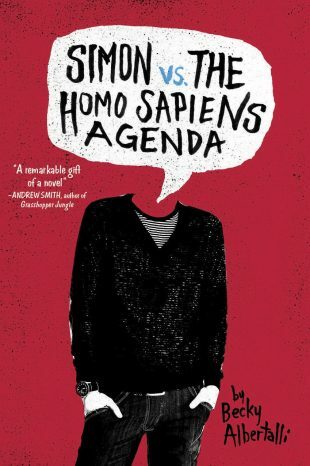 I have to say that going in, I had no idea what to expect from Simon vs. the Homo Sapiens Agenda. I had never heard of the book and the cover just happened to catch my eye as I was browsing at the library – bright red with a headless guy on the front and a stack of what appeared to be OREO cookies on the back. Say what?! Curious and quite amused by this combination of images, I decided to check it out and give it a go. I’m so thrilled that I did too. I kid you not – I don’t think I have ever smiled so much while reading a book as I did while reading Simon vs. the Home Sapiens Agenda. Even now, just thinking about the book again while writing this review, I’m sitting here grinning. What made this book such a wonderful read for me is that it’s a light and humorous story about love, family, friendship, high school life, and coming out as gay that, at the same time, conveys such an important message regarding the LGBTQ community – namely, that people who identify as LGBTQ are just like everyone else. Simon Spier, of course! Simon is this Oreo-obsessed high school junior who is in the drama club, knows pretty much everything there is to about Harry Potter, has a golden retriever named Bieber, and who is just all around adorable. Simon also has a bit of a crush on a fellow student who calls himself ‘Blue’. This budding relationship serves to add an extra layer of depth to Simon’s character. In what way? Well, because in spite of their growing mutual attraction, Simon and Blue have never actually met face to face and don’t even know each other’s real names. They met via the school’s tumblr and only communicate with via email using aliases. Why all the secrecy? Because as much as they like each other, neither Simon nor Blue are quite ready to come out publicly as gay. 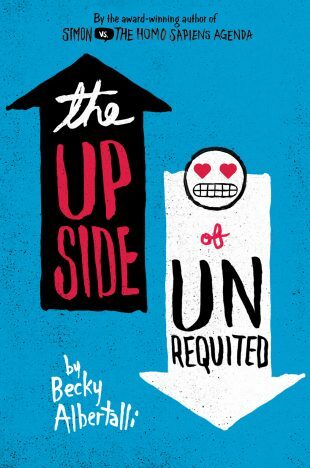 Aside from his just overall cuteness and his humor, what I loved most about Simon was the honest and relatable way in which Becky Albertalli portrays him. The first person point of view was key here. From the first page, you feel like you’re inside the mind of a teenage boy – how Simon can’t wait to rush to the nearest computer and read his next email from Blue and how his brain is on such overload when it comes to Blue that he walks off and absentmindedly leaves his emails to Blue open for the world (or at least for class clown Marty Addison to see). Once Simon realizes that Marty has the power to expose his biggest secret, and Blue’s as well if anyone were to figure out what Blue’s true identity is, we then go inside of Simon’s mind as he has to decide how to handle Marty. I really enjoyed how realistically and convincingly Albertalli writes the internal struggle that Simon faces. There are so many factors to be considered and we get an up close look as Simon goes through all of the pros and cons in his mind. Does he beat Marty to the punch and go ahead and come out as gay? But how will his family, friends, and other students react? Will they treat him differently? Will he be mocked and bullied? And himself aside, there’s Blue to consider. What if Blue isn’t ready to come out? He’s tormented by the idea that Blue could suffer because of his own carelessness. Simon and Blue as a couple. In addition to being inside of Simon’s head while he tries to figure out what to do about this whole blackmail situation, I also adored being able to follow his thoughts when it comes to his attraction to Blue. It’s a budding high school romance and Albertalli portrays it exactly like any other budding high school romance would be portrayed. Their flirtations are no different than if the two characters were male and female and I just thought this was so wonderful and so important. There are still too many people in the world who consider the LGBTQ community as deviant, and this book helps to dispel that mistaken impression. With Simon and Blue, there is absolutely no sense that they are in any way deviant. They are just two people who feel a connection and want to explore that connection, and the progression of their relationship is lovely to watch unfold. Not only are they portrayed as completely normal teens in love, but they are completely adorable. Even sight unseen, relying on nothing but emails to slowly build their relationship, Simon and Blue are seriously the cutest couple ever. I loved reading their silly flirtatious conversations, as well as their deeper and more meaningful conversations as they are each trying to decide how, when, or if they should come out as gay. Albertalli has made these two characters so likeable together and the progression of their relationship so completely natural that I think reading this book could be a mind-opening experience for a lot of people. Simon’s Squad. Okay, I’m all about a great cast of secondary characters and let me just say that this book has them in spades. I simply adored all of Simon’s friends – Nick, Abby, and Leah, and heck even Marty, the blackmailer, grew on me the more I got to know him. Another quality I really liked about this book is that Albertalli so vividly and fully captures the high school experience, that no matter how long you have been out of school, she transports you right back there. 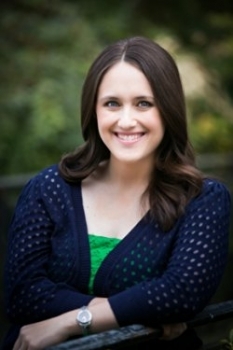 She is especially effective at portraying the often messy dynamics of high school friendships – when long-time friends suddenly become more than friends, when new friends join a peer group and others feel threatened or jealous because they worry they’ll get squeezed out, etc. Each time Simon’s circle of friends got shaken up by one of these things, I felt like I was being transported right back in time to my own messy circle of friends. It was very nostalgic for me in that sense. The Search for Blue: I had a lot of fun following Simon around and trying to guess which of his classmates might be Blue. And again, because Albertalli has portrayed every character as typical, average high school kids, Blue really can be anyone Simon encounters throughout his school day. I loved exploring all of the possibilities, especially as I got to know a little more about each character. And like Simon, I made several incorrect guesses before Blue is finally revealed. Themes: I love that, in addition to being such a fun and entertaining read, this book is also filled with so many positive messages in it about love, friendship, family, and community. I also wish this book had been around when I was in school because I think a lot of LGBTQ students I went to school with would have found this book helpful : 1) in letting them know they’re not alone in what they might be feeling, and 2) in helping them realize that family and friends might be way more supportive than they might otherwise expect. The only thing that comes to mind was that it did take me a while to get used to reading the emails between Sam and Blue. Not because of the subject matter or anything like that, but just because at first, it didn’t feel like they flowed well with the rest of the novel. Once I got a little more used to the style, it stopped bothering me though. This is one of those books I would recommend to pretty much everyone from high school age right on up through adulthood, and I’d especially recommend it to parents. Why? 1) Because it’s a super cute and fun read that I think everyone can enjoy, and 2) Because it’s an important book that has a lot to teach you, if you let it. Maybe you’re not a student yourself, but you might be a parent with a child who might be LGBTQ and who might go through something like Simon and Blue did. This book can only help to increase your understanding of what your own child might go through. As I was reading, I couldn’t help but think that Simon could easily be my own son. So yes, just such an important book on many levels. Rating: A very strong 4 stars!